The Y’all Entertainment Launch Party is set for Sunday, July 29 at Home Team BBQ at 1205 Ashley River Road in West Ashley. 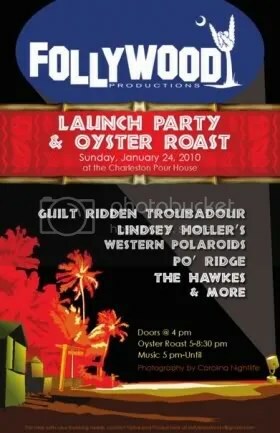 It should be an awesome night with a house band featuring Danielle Howle, Luke Cunningham, Mac Leaphart, Reid Stone, Tyler Mechem & lots of special guests TBA, as well as the first local full-band performance by The Tarlatans, a band originally from Clemson that is about to crash the Charleston scene. This is an FREE all-ages show, open to the public & sponsored by Virgil Kaine Bourbon. Ya’ll Entertainment is a new joint venture between Joel Frank and Ben Bounds that will help artists, festival coordinators, music venues, university organizations and other folks in the music and entertainment industry find creative ways to organize and promote their events and careers. Along with celebrating a new company, this should be a party where great music will be made!